Lot’s often said that a married couple shouldn’t work together, but German chef Josef Sauerschell and his Mallorcan wife Leonor Payeras have been doing just that since 1986 – and seemingly without any detrimental effect on their relationship. They first worked together at the hotel now known as Belmond La Residencia, in Deià, where Josef ran the El Olivo kitchen. In 2000, the couple achieved the dream of many chefs: opening their own restaurant, also in Leonor’s home village, Deià. Michelin had previously awarded Josef’s cuisine a star at El Olivo and, a year after Es Racó d’es Teix opened, Michelin awarded it one star – an achievement that has been repeated every year. Since 2001, Josef and Leonor’s delightful restaurant has been the only establishment in this part of Mallorca to have the enviable star. The romantic restaurant took its name from its hideaway location, along a steep lane on the edge of the village: ‘racó’ is the Mallorcan word for ‘corner’ or ‘nook’; Teix is the mountain that feels like a mighty protective presence over the village. Josef is, of course, in the kitchen – where he creates honest, flavourful and delicious Mallorcan/Mediterranean cuisine that makes the most of high-quality fresh produce from the surrounding area. The fish tastes of the Mediterranean, the flavour of the lamb is evocative of the Tramuntana mountains; because Josef uses high-quality produce, he allows the main ingredient to shine as the star of each dish, which has clearly definable flavours. Service is led by the charming maître d’ Leonor, and the front-of-house team has a warm family feel to it – one of the aspects of this place that has won it many fans.Es Racó d’es Teix is for those who appreciate gastronomy, professional but warm service, and a superb choice of carefully selected wines. 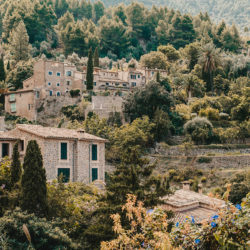 “Our clients are surprised not only by our setting, hidden away in the village of Deià and with spectacular views, but also by the high level of cuisine and service,” says Josef.